Adele’s theme to Skyfall is the best James Bond song since Goldfinger, restoring a bit of honor and award-winning class to the legacy of a group of songs that increasingly went off the rails. (Sheryl Crow for Tomorrow Never Dies, Madonna for Die Another Day). 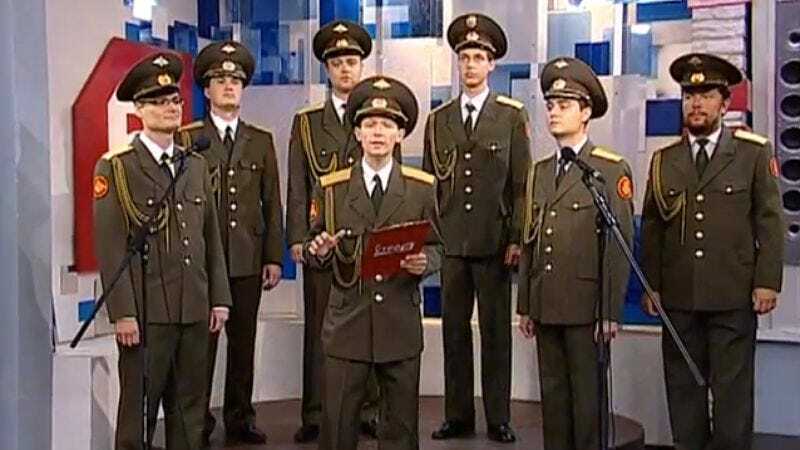 Though not many artists can match Adele’s range or vocal intensity, the Russian Army Choir performed a surprisingly amazing cover on a Russian morning show. The seven-man choir, in full army regalia and all legally straight, is led by a soulful and lilting soloist and stunned the hosts, who just can’t stop bobbing along to the song. Though they are singing along to a backing track, it’s hard to imagine anyone coming this close to equaling Adele.